Despite a string of encouraging strikes and labor victories, the latest numbers show that union density fell to a new low last year. Union density — the share of employed workers belonging to unions — fell to 10.5 percent in 2018, the lowest since the Bureau of Labor Statistics began reporting the data in its modern form in 1964, down from 2017’s 10.7 percent. (See graph below.) After rising 0.1 point in 2017, private sector density fell back to match 2016’s 6.4 percent — a hair below 1900’s level, 6.5 percent. Republican governors’ war on public sector unions is having a visible effect: just 33.9 percent of government workers belonged to unions last year, the lowest since 1978, when membership was on an upswing — an effect that is only going to intensify as the effects of the Supreme Court’s decision in the Janus case, which forbids mandatory payment of union dues, spreads. There’s an old lie that unions are good for white men and no one else. That’s the opposite of the case. As the graph below shows, black women, for example, earn 63 percent as much per week as white men overall; belonging to a union brings that up to 78 percent — still a large gap, but a much smaller one. 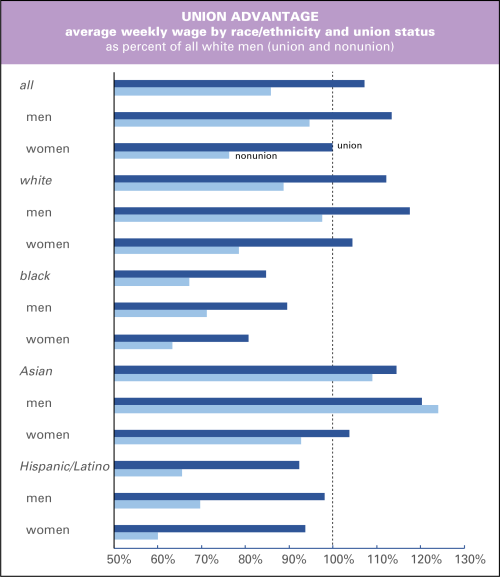 Nonunion Latinas earn 60 percent as much as white men; a union brings that up to 83 percent. And, as a team of researchers from the Economic Policy Institute argues, unions can raise the level of nonunion workers if they’re prevalent enough in a geographical area or industrial sector. No wonder employers hate them. 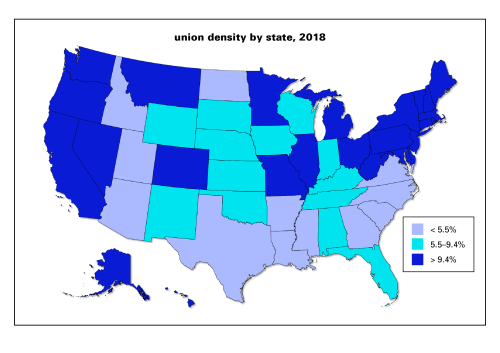 Union density varies widely by state, as this map shows. They’re strongest in the Northeast and far West, mixed in the Midwest, and weak in the South and interior West. 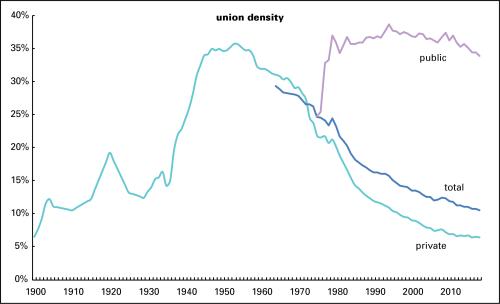 Changes in union density also vary widely by state. Since 2000, density is down 3.0 points. It is down in every state (including DC) but three. Losses were small in high-density Massachusetts and low-density Alabama and North Carolina. Density was down hard in states where reactionary governors made war on organized labor — most notably, Scott Walker in Wisconsin, but even Chris Christie in liberal New Jersey. New York, the state with the second-highest union density in the country, 22.3 percent, saw an above-average loss of 3.2 points. 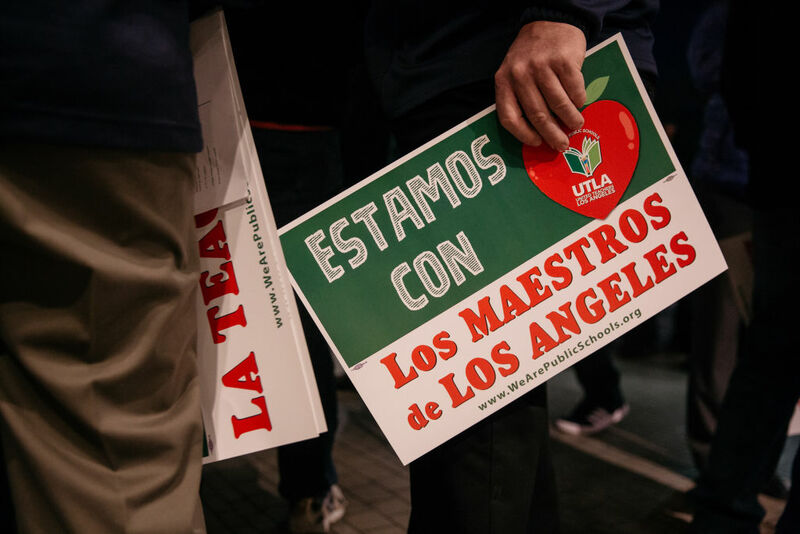 There are signs of life in the labor movement, most recently the spectacular victory by the Los Angeles teachers, following upon the upsurge in West Virginia, Arizona, and Oklahoma last spring. And we’ve seen some organizing in the electronic media. These are extremely cheering signs. But we’re going to need a lot more of this if the erosion of working-class living standards is ever going to be reversed.